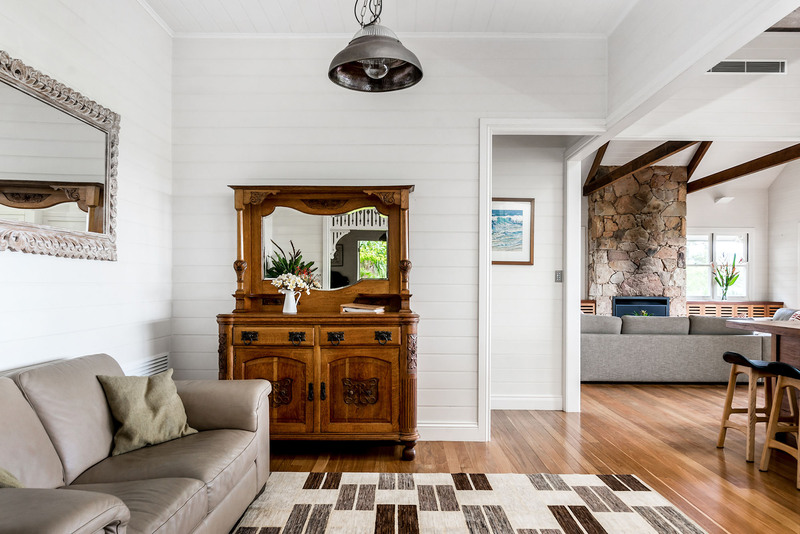 Nestled on six rolling hinterland acres in Coopers Shoot, a relaxing stay at Rutherford House near Byron Bay is pure luxury. This spacious, scenic home will charm you with its magnificent surrounding gardens, stunning swimming pool, and breezy interiors. With five big bedrooms and three modern bathrooms, Rutherford House can easily accommodate a group of up to 12. It is a dream to entertain here, thanks to the gourmet kitchen, spectacular pool and backyard, as well as ample spaces to lounge and relax inside or out. 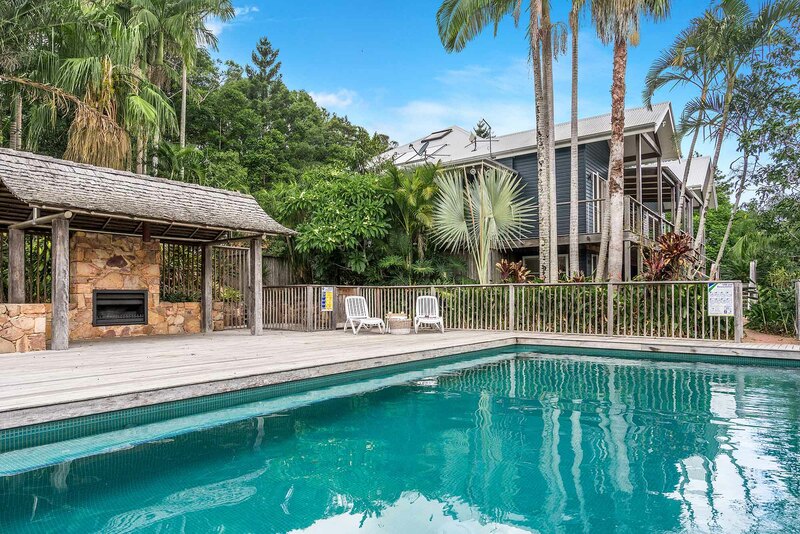 Enjoy a serene environment while still just a short drive into town or Byron’s beaches. At the centre of this home is an inviting, open living room with soaring ceilings and rustic wooden beams. The floor-to-ceiling, brick feature wood-burning fireplace and crisp, white ship-lapped walls add to the space’s natural warmth and light, airy feeling. Settle into the large, sectional sofa for a comfortable spot to lounge with a book, chat, or play a game of cards. This central gathering space opens into the kitchen and onto the outdoor deck via retractable screen doors. Downstairs, an additional “rumpus room” living space feels even more relaxed with another wood-burning fireplace and a large flat screen TV with Netflix and Foxtel. The immaculate gourmet kitchen boasts integrated, stainless steel appliances including stovetop, two ovens, fridge, and a top-of-the-line espresso coffee machine. This beautiful space is open to the upstairs living area and anchored by a large kitchen island with breakfast bar seating, perfect for enjoying your morning brew. The large window opens fully to frame the stunning hinterland views and also overlooks a covered, open-air dining space with a table for 8. For more formal gatherings, the separate dining room is located just down the hall and furnished with a gleaming 8-seater wood dining table. With five spacious bedrooms and three bathrooms, Rutherford House can easily accommodate 12 guests comfortably. There are four bedrooms upstairs, including a spacious master suite with queen bed, balcony, and ensuite master bathroom with separate tub and rain shower. There is another shared bathroom in the hallway, and three more bedrooms, two with queen beds and one with two single beds. These can be pushed together to form a king, on request. One of the queen bedrooms also has a built-in reading nook, the most enchanting little space to relax with a good story. Downstairs is an additional bedroom with a queen bed and single bunk, plus a shared bathroom in the hallway. Whether you’re getting ready to start the day or simply hoping to wind down, the three elegant bathrooms at Rutherford House are ideal. Just off the master bedroom is a luxurious ensuite with soaking tub, glass-walled rain shower, and ample vanity space. The other two shared bathrooms are similarly designed with lots of natural light, one found on each floor of the house. Rutherford House makes entertaining an absolute delight, indoors and out. There is a natural flow between the house and its outdoor spaces, ensuring you and your guests are able to enjoy it all together. The expansive outdoor deck surrounds the upper level of the house with outdoor BBQ area and two dining spaces perfect for al fresco meals. Wander down one of two timber staircases to the large swimming pool featuring expansive deck area, poolside cabana and outdoor fireplace. Just try to tear yourself away from this spectacular pool! Fitted with stunning, custom tilework and surrounded by a wooden deck, the saltwater pool is heated to the perfect temperature for any time of year. Relax poolside in one of the sun loungers or get some shade beneath the stylish cabana. Two cars can park in the covered carport and there’s space for two more cars off-street in the driveway. Bordered by Byron Creek, Rutherford House sits on six lush acres of beautiful hinterland just 13km from Byron Bay. The CBD and Byron’s famous beaches are reachable by car in about 15 minutes, while the charming town of Bangalow is even closer. Only a five-minute drive from your front door, Bangalow is home to a number of quirky antique shops and excellent restaurants like the popular Harvest Newrybar. Intimate events, photo/video shoots may be arranged directly with A Perfect Stay/Byron Bay Holiday Rentals. Additional fees and T&C’s apply.